Welcome to the Groundwater Foundation's online shop. We accept MasterCard, VISA, Discover Card, American Express, and Diners Club. If you need to request a form for a purchase order, or have other questions regarding Catalog products, services, or policies, please contact us at 1-800-858-4844 or info@groundwater.org. 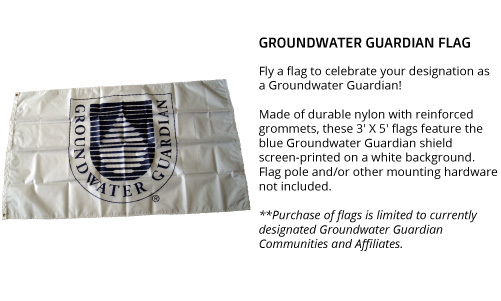 Groundwater Guardian flag. Flag pole and/or other mounting hardware not included. *Note: The purchase of this item is limited to currently designated Groundwater Guardian Communities and Affiliates.